What Should a Pregnant Woman Do After a Florida Car Crash? If you or a family member was involved in a car accident or other traumatic incident while pregnant, your first priority should be a thorough medical evaluation. 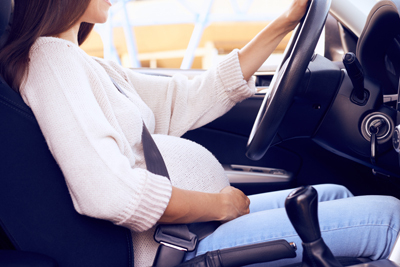 Pregnant women involved in car crashes are at increased risk for complications for both the child’s and their own health, even when dealing with minor injuries. Trauma complicates one in twelve pregnancies, and is the leading non-obstetric cause of death among pregnant women and among the most common causes of non-obstetric maternal risk factors for spontaneous abortion, preterm labor, and premature delivery. Motor vehicle accidents, domestic violence and falls are the three leading causes of abdominal injuries among pregnant women in the United States, with motor vehicle crashes accounting for more than half of all trauma during pregnancy. Over eighty percent of fetal deaths are caused by these crashes. Although most traumatic injuries during pregnancy are classified as minor (ninety percent), roughly a third of fetal losses after trauma are a result of these minor injuries. A study authored by Neha Deshpande MD reported that pregnant trauma victims generally suffered less severe injuries than their non-pregnant counterparts. However, despite less severe injuries, pregnant women were nearly twice as likely to be dead when they arrived at the hospital, or die in the hospital. The study explained the body of a pregnant woman is already extended in the care of the child and has less capacity to recover from injuries than a woman who is not carrying a child. I share these statistics for two reasons. One- according to a Canadian study, women are as much as forty-two percent more likely to be involved in a car accident in their second trimester than in the year preceding pregnancy. Two- so you understand the importance of an immediate medical evaluation, even if you are only dealing with what appear to be minor injuries. If you were pregnant at the time of a car accident, fall or any type of traumatic incident, make sure you schedule an appointment with your obstetrician/gynecologist as well as any emergency or urgent care physician right away. In addition to the health concerns which may be greatly reduced by prompt treatment, your Personal Injury Protection (PIP) coverage through your auto policy will pay for your initial medical care, but you must see a doctor within fourteen days of the collision and receive a diagnosis of an emergency medical condition (EMC). During the first trimester of pregnancy, the uterus is still relatively small and well protected from trauma by the pelvic girdle. In the second trimester, large quantities of amniotic fluid surround and protect the fetus. Once you have reached the third trimester, the wall of the uterus has begun to thin out and grow, leaving it exposed to a potential traumatic impact. The placenta is normally attached to the uterus. Placental abruption is the separation of the placenta from the lining of the uterus, which cuts off the baby from its source of nutrients and oxygen. It can occur when trauma involving acceleration and deceleration deforms the uterus and shears the placenta off its implantation site on the uterine wall, or from a direct impact to the abdomen. Every woman experiences different signs and symptoms in response to an injury, in fact, some don’t experience any. Some of the more common indicators of placental abruption include the following. Placental abruption is just one of various issues pregnant women should be aware of after a car crash. There are specific protocols for doctors who treat pregnant women for traumatic injuries, such as fetal monitoring and tocodynamometry after a certain number of gestational weeks. In critical situations, perimortem cesarean deliveries (C-sections) and hysterectomies may be performed in an attempt to save both the mother and the child once the child has reached viability. Of course, these procedures present risks of their own. Seat belt use generally decreases during pregnancy, because women are concerned the seat belt will hurt the fetus in the event of a collision and because as the abdomen grows, the seatbelt becomes more uncomfortable. The same occurs with airbag use. But in cases of blunt trauma (like car crashes), the most common cause of fetal death is maternal death. In short, the best way to protect your child is to protect yourself. Wear your seatbelt the right way and do not turn off your airbags. Proper seat belt use reduces the risk of maternal and fetal injuries in motor vehicle crashes, but wearing a seatbelt incorrectly can increase the risks of injury to your child. The lap belt should be placed as low as possible under the extended abdomen or baby bump, and the shoulder belt should be off to the side of the uterus, between the breasts and over the mid portion of the clavicle. You should not wear your seatbelt so the lap belt sits over the dome of the uterus because it will tighten upon a rapid stop or collision. Ahmadi, Alireza et al. “Traumatic Injuries in Pregnant Women: A Case of Motor Vehicle Accident for ‘Ground Round’ Discussion.” Journal of Injury and Violence Research 3.1 (2011): 55–59. PMC. Web. 31 Oct. 2017. Murphy NJ, Quinlan JD. “Trauma in pregnancy: assessment, management, and prevention.” American Family Physician 2014 Nov 15;90(10):717-22. Web. 31 Oct. 2017. Redelmeier, Donald, et al. “Pregnancy and the risk of a traffic crash.” CMAJ May 12, 2014 First published May 12, 2014, doi: 10.1503/cmaj.131650. Web. 1 Nov. 2017. Yeganeh, Naser. “Traumatic Injuries in Pregnant Women: Anesthesiology Aspects.” Journal of Injury and Violence Research 3.2 (2011): 111–112. PMC. Web. 31 Oct. 2017.